Consumer is evolving and she is evolving at an unprecedented pace. This has disrupted the very dynamics of the sales process. To keep up with this rapid change just sales force automation would not do. A synergistic solution combining CRM and ERP is the need of the hour. Enter Microsoft Dynamics 365 for Sales a solution that seamlessly combines these two to deliver a powerful platform that helps you better understand customer needs, engage her more effectively, and win more deals. 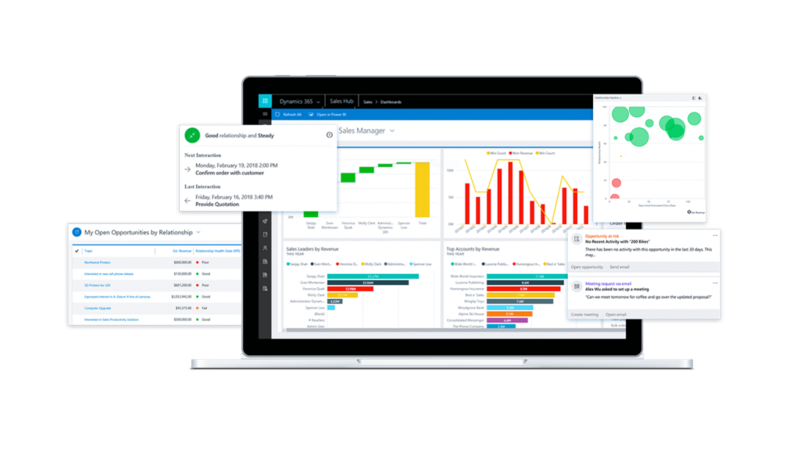 Watch this short video to learn more about the Microssoft Dynamics 365 for Sales and how it can help you run your business better. The best-armed sales team is an informed one! The embedded intelligence of Dynamics 365 ensures that they get recommendations and guidance at every stage of the customer journey like how to reach to a particular customer, when should you send an email etc. The solution also keeps track of social trends and competitor activity. The platform ensures that your customer interactions are always relevant and productive. In a nut-shell Dynamics 365 for Sales helps your sales team stay focused on what they do best – Sell! Dynamics 365 for Sales helps you reach out to the right buyers. The solution facilitates authentic and personalized engagement throughout the customer journey. You can create customized communication and documentation. The social media integration enables you to generate insights into what the buyers want or are thinking. The built-in multi-media outreach, helps you engage with your customer on her preferable platform(s) – boosting the customer confidence and comfort with your sales team. The consumer perceives your team as a confidant and problem solver. This would not just help you up-sell or cross sell to the same consumer but she will be your brand ambassador and will help you get more clients. Your customer engagement will not from be transactional but flower into a lasting relationship. On the front end, users will find familiar tools like excel, outlook etc. to work on, giving them instant comfort, speeding up the on-boarding process. The solution seamlessly integrates business data with Office 365 and LinkedIn data to guide sellers throughout the sales processes. This increases user adoption and minimizes the need for training. The sales team is able to work on the solution right from day 1. You are able to accelerate deals with an end-to-end, immersive experience. Tools like Excel and Outlook used for day-to-day sales activities, enable you to monitor individual cases without switching apps. On the front end, users will find familiar tools like excel, outlook etc. to work on, giving them instant comfort, speeding up the on-boarding process. The solution seamlessly integrates business data with Office 365 and LinkedIn data to guide sellers throughout the sales processes. This increases user adoption and minimizes the need for training. The sales team is able to work on the solution right from day 1. You are able to accelerate deals with an end-to-end, immersive experience. Tools like Excel and Outlook used for day-to-day sales activities, enable you to monitor individual cases without switching apps. You have 24X7 access to sales performance data through the analytics dashboards, which provide a historical perspective, as well as predictive guidance. You can keep the sales team motivated by setting more realistic targets and device sales contests for the added boost. Transparency and appropriate flow of information at all levels fosters teamwork and accountability. The new team members can be speedily on-boarded, there by enabling you speedily ramp-up your operations. is automated and connected across accounting, sales, purchasing, inventory, and customer interactions, giving a comprehensive snapshot of your business. The BI dashboards enable you to chart financial performance in real time2, helping you analyze data from multiple vantage points. The MS Excel integration allows you to create customized reports with the flexibility of varying key factors. This improves forecast accuracy. The automated streamlining of accounts (payables & receivables) and their reconciliation allows for speedy financial closure and better compliance. Do more with less – should be your inventory management mantra. Dynamics 365 for Sales has built-in predictive intelligence to help you increase availability with lower inventory levels. The platform automatically captures and analyses inventory data viz. stock levels, lead times, and reorder points; and even suggests substitutes in case of stock-outs. The platform also monitors the credit periods and limits, thus maximizing profitability by availing discounts and avoiding late payment penalties. The Dynamics 365 for Sales keeps track of all customer interactions providing real-time guidance to the sales team on each customer and the best way to exploit her potential viz. upsell, cross-sell, and renewal opportunities. With ready insights the sales team can speedily prepare quotations and develop specifications that are more likely to be accepted by the consumer. This accelerates the sales process, leading to an early closure. The insights also come in handy in case of providing customer service, or to quickly resolve a customer complaint. The result is higher sales closures and delighted customers. Make realistic delivery schedules and never miss out on your promise of delivery. Microsoft Dynamics 365 gives you a comprehensive overview of of inventory, availability of raw materials, work in process, finished stock (availability and location), transit times etc. The platform also helps to optimize indenting, manufacturing, warehousing and dispatch capacities. You will always be able to make achievable delivery schedule and promise what you can deliver to your customers. It also enables you to operate on Just-in-time schedules, crashing lead times and controlling financial budgets.